Grew Up… learning the ancient way of the samurai. From birth, Katsumoto has been training as one of Japan’s traditional warriors – martial artists who are bound by the strict Bushido honor code. They are unmatched in their discipline, loyalty, and commitment to the emperor. Living… in 1876, when the way of the samurai is dying. The realities of industrialization have forced the Japanese Emperor to modernize the military by adopting western weapons and tactics. In a world of rifles and Gatling guns, there is little need for the sword-wielding-samurai. Katsumoto is unwilling to accept this transformation, seeing it as the beginning of the end of Japanese culture. 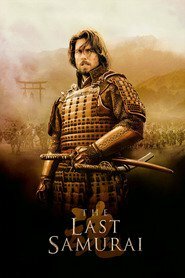 In an effort to stall the modernization of Japan, he leads a samurai rebellion dedicated to preventing the professionalization of the army and the dissolution of Japan’s ancient warrior class. Profession… samurai. Katsumoto is a well-respected warrior who emulates the best of the samurai on and off the battlefield. A swordsman, poet, and philosopher, Katsumoto seeks to find perfection in all things. Interests… meditation, martial arts, and all the other traditional skills of a samurai. From sun-up to sundown Katsumoto is disciplined, and sets about maintaining his skills as a warrior and leader. However, his is not a cold discipline, and he is social and interested in the life of Nathan Algren, the American consultant to the Japanese military and Katsumoto’s captive. Relationship Status… married with children. His son Nobutada is rising in the ranks and becoming a true samurai like his father. Katsumoto is proud of his son, but mourns the fact that the samurai may become an anachronism before Nobutada can realize his true potential. Challenge… preserving the way of the samurai. While Katsumoto is surrounded by die-hards who follow the old customs, the emperor is increasingly acknowledging the benefits of westernizing the nation. While Katsumoto is loyal to the emperor, he believes modernization will erode the soul of Japan, an ignominious fate that he will not allow to befall his nation while he still draws breath. Personality… calm, honorable, and thoughtful. He spends a great deal of his day meditating on small details with his eyes closed. Katsumoto doesn’t seek pleasure through frivolous avenues or sins of the flesh, and instead seeks to be at peace with the world around him. He is unshakingly loyal to the empire and Japan, and willing to die for the principles of the rebellion he leads. Katsumoto's popularity ranking on CharacTour is #2900 out of 5,000+ characters. See our top-ranked characters and read their profiles.